Leave it to former Auburn football coach Pat Dye to add a little controversy this week. While speaking at the Montgomery Quarterback Club, Dye said this about Gene Chizik and Nick Saban. Dye basically said the same thing on the Paul Finebaum show a few weeks ago stopping short of saying that Chizik was a good head coach, but saying he was the better man. As a Alabama fan, you have to smile and chuckle because you’d probably NEVER see a former or present head coach in Tuscaloosa mention the Auburn head coach unless by name unless it is during Iron Bowl week. 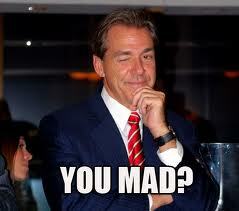 So you know Saban must be getting to Dye if he has to even MENTION his name at an Auburn event.